Easy to swallow foods are those that require little to no chewing. This is beneficial for the elderly who have trouble chewing food due to lack of teeth and this may lead to many nutrient deficiencies which can be detrimental to their health. Foods can be made soft by grinding, grating, stewing and mashing them to make it easier to swallow. Tougher foods can be swallowed easily if they are boiled or steamed. 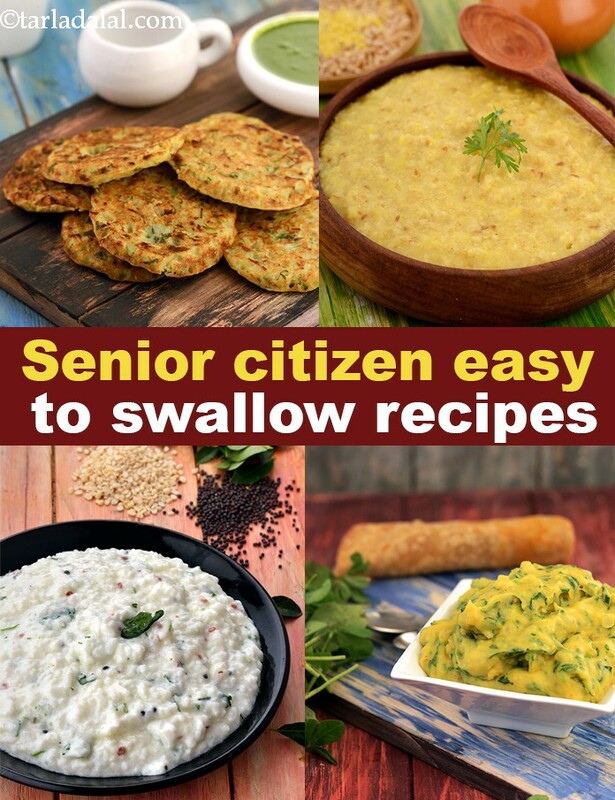 These are a few tips that are beneficial for the elderly who have trouble swallowing food. Kickstart your day with healthy breakfast such as oats porridge, upma, which are packed with protein and carbohydrates. Jowar Ragi and Date Porridge is a great breakfast option. · Try to include moisture containing foods such as clear soups, broths and stews can be readily swallowed without issues. Low Calorie Spinach Soup and Carrot Soup Gajar Soup Recipe are a few picks to have for a light dinner or as an in between snack. Add fresh fruits and vegetables to your diet such as bananas, avocados, chopped melon, ripe peaches and berries which can be blended to make smoothies and juices. Choose juices which are prepared without added sugar. Papaya Pear and Yoghurt Smoothie are healthy smoothie options which can be prepared from greek yogurt or hung curds. Load up on vegetables like carrot, tomatoes or pumpkin which can be easily boiled, mashed or ground. They are nutrient dense as well as high in fiber. Most of dairy products are easy to swallow such as milk, curd, yoghurt, buttermilk and cheese. Choose low-fat options if you are trying to shed those extra pounds. Eat smaller and frequent meals and snacks which are nutrient dense instead of 3 larger ones. Foods to avoid if you have trouble swallowing food. Limit consumption of raw vegetables and tough to chew fruits with thick skin such as apples, pineapple, dried fruit, corn kernels, etc the fiber can get stuck in the throat and may cause you to choke if not chewed well. Foods such as plain biscuits, papad, chakli, chikki, bread sticks should be avoided completely. Completely eliminate crispy and fried food from your diet like potato chips, wafers, chivdas..